One Life To Love: What are you reading? Happy Wednesday! Middle of the week can feel so blah. Waiting for Friday, yet you are done with almost half the week. I just dropped in to tell you what I have been reading. I have been reading these smallish books. I have reached only up to the first few chapters in A Novel In A Year. Its an edited, added version of Louise Doughty's newspaper columns, published weekly over a year. She writes about a realistic goal of achieving a manuscript, at the very least an idea for a Novel manuscript within a year. I found the book interesting, helpful or not I need to find out. I will keep you informed on it. 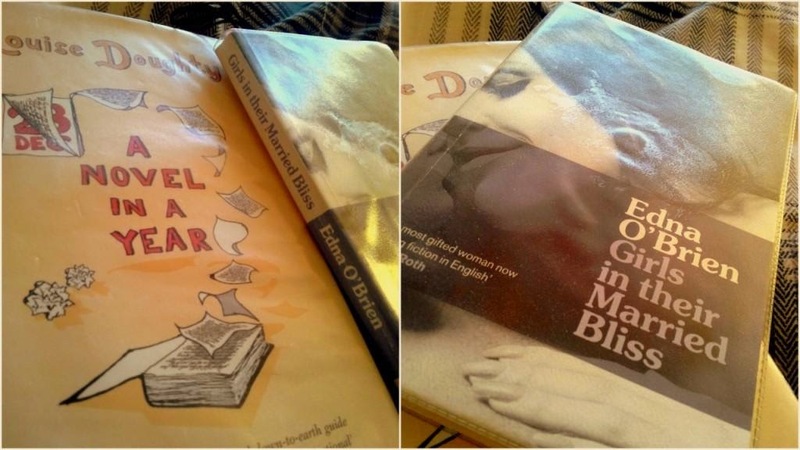 Edna O'Brein's Girls in their Married Bliss is a funny novella about two married friends. One of them is a self pitying housewife who leans on the other one for everything from cover ups to safe havens. While the other friend who is a trophy wife, level headed yet equally frustrated has enough problems of her own. The narration by Baba, the protagonist is funny, not deep, yet entertaining. It's a quick read, I am halfway through it. What are you reading? Anything new/old you hope to complete reading this month. The new Lena Dunham personal essays seem like a good idea. But it won't show up in our library as yet. Also I am so waiting to get my hands on this one for so long.